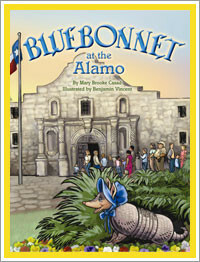 SPECIAL OFFERS - Bluebonnet the Armadillo Limited time only: CD of author Mary Brooke Casad reading, "Bluebonnet of the Hill Country," "Bluebonnet of the Alamo," and "Bluebonnet at the State Fair of Texas," offered for $12.00 (includes CD on sale for $10.00 (regularly $19.95); tax, postage and handling). FREE Teacher's Guide of questions and activities for classroom included. First ten orders also receive FREE packet of Bluebonnet Armadillo bluebonnet flower seeds! Email mbc@bluebonnetarmadillo.com with your order. 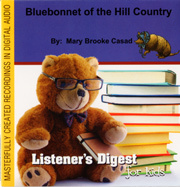 Limited time only: CD of author Mary Brooke Casad reading, “Bluebonnet of the Hill Country,” “Bluebonnet of the Alamo,” and “Bluebonnet at the State Fair of Texas,” offered for $12.00 (includes CD on sale for $10.00 (regularly $19.95); tax, postage and handling). FREE Teacher’s Guide of questions and activities for classroom included. FREE bookmark included. 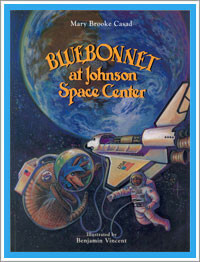 First ten orders also receive FREE packet of Bluebonnet Armadillo bluebonnet flower seeds! Must order direct for this offer; email mbc@bluebonnetarmadillo.com with your order.